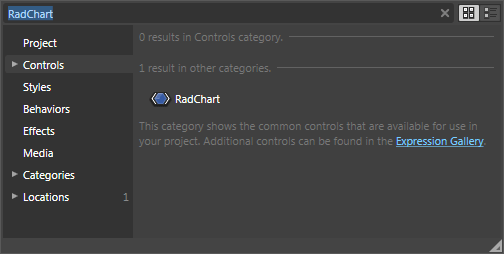 RadChart is an advanced WPF control providing full Blend support. From within the visual environment of Blend, you can easily perform various tasks such as edit control properties, modify themes, create and modify templates and more. There are two things you should pay attention to: First is the declaration of the Telerik.Windows.Controls namespace from Telerik.Windows.Controls.Charting assembly and the second is the declaration of the RadChart control itself. Now create custom method that returns collection populated with several ProductSales objects. Now after you have the needed data object it is time to configure and bind the RadChart to the appropriate properties of the ProductSales class. It can be done using SeriesMapping/ItemMapping from XAML or code-behind, but in most cases it is better to do it declaratively. In the source code above one instance of the class SeriesMapping is created with two ItemMappings, one for X-axis and one for Y-axis. X-axis is bound to the ProductSales.Month property, while Y-axis is bound to ProductSales.Quantity property. Both properties are numeric, that's why their DataPointMember property is set to XValue and YValue respectively. If you want to bind your X-axis to string values read Categorical Charts or read below. And the last step is to set the ItemSource of the RadChart control to the collection returned by the GetData method. You can insert this call inside your Constructor right after the InitializeComponent() method call. RadChart has automatically generated value ranges for both axes X and Y, based on the values provided by the data source. If needed you can specify the ranges manually. 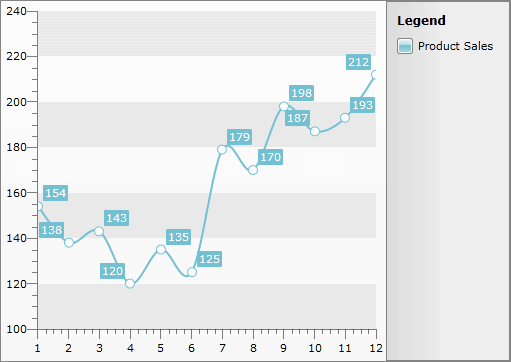 The Chart Legend is also generated automatically, containing information about the only one available series "Product Sales". X-Axis shows the month numbers. Y-Axis shows the sold quantity values. 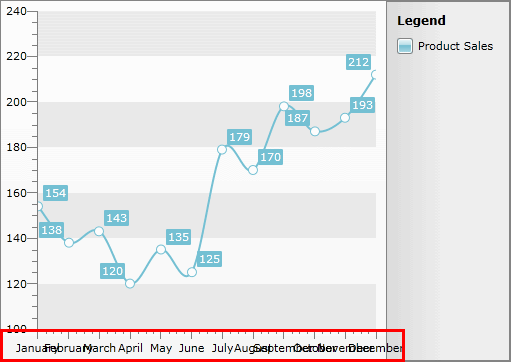 The X-axis can be further customized by replacing the month numbers (1, 2, 3...) with the respective month names (January, February, March...). To achieve this we have to set the ItemMapping.DataPointMember property for the X-axis to XCategory and the ItemMapping.FieldName to "MonthName", as shown in the samples below. And here is the same chart but this time showing month names as categories for the X-axis instead of the month numbers. To make the x-Axis labels more readable you can use one of the label features provided by the XAxis class. For more information read here.